Are we in step with God's purposes for our lives and through our lives? . Jonah was an established, practising prophet (2 Kings 14: 25). He was the one who prophesied in the Northern kingdom of Israel. He was prophet to the Jews. One day, God tells him to go somewhere else i.e. Nineveh- a world power at that time. The Assyrians were powerful, ruthless and cruel and were hated by the Jews. Years later, God uses Assyria to bring judgement on Israel. Now Jonah has to go and give them a message of mercy which he did not want to do. He wanted them punished. So he ran away and was out of step with God i.e. that God was not just interested in Israel but the nations of the world. We can be cosy and comfortable here but God wants more. When Abraham and Moses were told that God would destroy the world, they pleaded on their behalf. But Jonah wanted them destroyed. As Jonah was away- the book is more about Jonah than Nineveh. In fact, (3:4) the prophetic word was only one sentence, i.e. repent. This book is not about the revival of a city but God’s love for a rebellious child. God loves us inspite of our rebellion and he is committed to you. 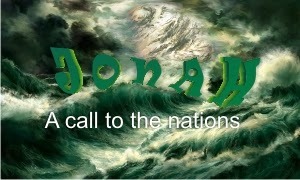 God is committed to working through Jonah. God is committed to working through our lives. Jonah being a prophet was a man who spent a lot of time in God’s presence to hear God speak. Jonah is now running away and he finds a ship. Be careful of circumstances guiding you- was that God’s boat? We need to be guided by the WORD. Jonah tries to flee- Has he not read Psalm 139? So he goes to Tar shish and in verse 3 in the boat, he fell into a deep sleep. In verse 4 God sends a storm. Can God send a storm? Yes he can because he is committed to his child. Heb 12- God disciplines his children and in different ways. Here God sends a storm (some come from the devil, but this was from God). The sailors try everything but Jonah was sleeping. He has to be shaken awake. The world is crying out to their own gods and we can be like Jonah- asleep, watching T.V., getting on with life, our career and we can miss out on the cries of people all around. Q. Are we awake to the purposes of God or just pre-occupied with our own lives? God is concerned for us and sometimes, a storm hits to rouse us from our slumber to the purposes of God. In verse 8 Jonah is now found out. He tells them that he is a Hebrew and that he is running away from God. In Verse 12, it looks that Jonah knew the solution. The sailors acted with compassion and tried not to throw him over. But the irony is that Jonah had no compassion. In verse 15- the raging sea is calmed and the sailors saw the power of God and they became believers. God can use our mistakes to turn things around. This is the amazing thing about the sovereignty of God. Jonah is thrown overboard and swallowed by a giant fish. This is not a fairytale but a true story. Even Jesus refers to it. Judgement hangs over the whole world. But we have one greater than Jonah. Jesus, who was not thrown in the sea but hung on the cross for you and me. The nations are waiting. Ephesians 2:10- there are good works prepared in advance for us to do. We need to be a part of a local church, plug in and serve, loving one another and be a people who are missional for the nations. We will look at the next part of the story next week.